There was a time in my life when I couldn’t face red wine. History doesn’t recall why. Except that it was a brief phase. I was younger. And it probably involved over-indulgence and hangovers. We invited some friends over for dinner. It was winter and we plumped for venison casserole. Off I trotted to my local Nicholas for advice (in the days when Nicholas did that pretty well). I have no idea what red I bought. But I do remember that, after much head scratching, a white Graves was placed in my hand and I was encouraged to “give it a go”. I did and do you know what? It may not have been a match made it heaven, but its smokey savouriness held its own against the robust dish. Except I wasn’t. Like a brief encounter, it was a wonderful moment, to be treasured for ever after. A moment I wanted to repeat, but somehow never got round to until more recently. Yet dry white wines from the Bordeaux region of Graves – and Pessac-Léognan in particular – are right up my street. These wines – generally Sauvignon Blanc with some Semillon added – are made for ageing. They sit on their lees (post-fermentation yeast) in a barrel for months, which give them body and structure. They can be enjoyed when young and fruity, but the older they get, the more intriguing they become. A few weeks ago, I was invited to a dinner to sample and compare wines from two Pessac-Léognan producers, Chateau Brown and Chateau Couhins – red and white. The reds were good – it’s one of the value areas of Bordeaux, where you can get some great reds for comparatively better prices than further up on the left bank. However, the star of the evening for me was the 2010 Chateau Brown Blanc, a blend of 65% Sauvignon Blanc an 35% Semillon. Its fleshy texture and gunflint palate layered with ripe stone fruit and citrus flavours thrilled me and I could only imagine the savoury delights ahead with five or so more years of ageing. 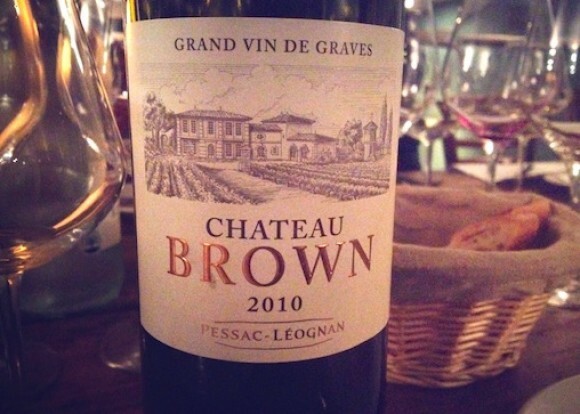 “Brown want to make wines that please, that make an early impression,” explained Agathe de Langhe at the dinner. The 2010 Blanc definitely succeeded with me. Subsequently, it has won a trophy at both the International Wine Challenge 2012 and the Decanter World Wine Awards 2012. Expect to pay around £24 for a bottle after tax and duty. Fine + Rare is a good place to look. 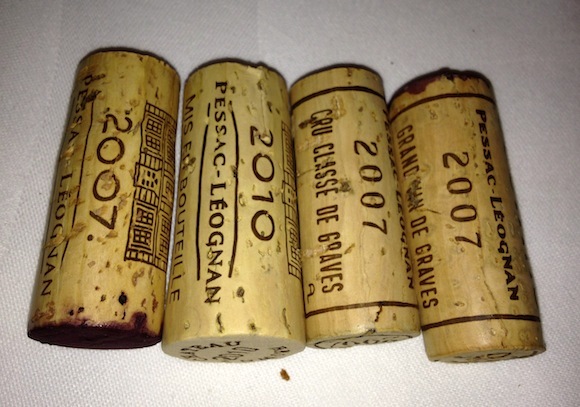 I rediscovered my excitement for dry whites from Pessac-Léognan at a Bordeaux Grands Crus Classés tasting last year. A formal and rather daunting affair (for the humble blogger at least) it is also an opportunity to sample several young vintages of some of the region’s most revered producers. While everyone was crowding around the Pontet-Canet reds, I tucked myself away by the Chateau Smith Haut Lafitte table and began with the whites on show. Smith Haut Lafitte Blanc is almost 100% Sauvignon Blanc with a splash of Semillon and Sauvignon Gris. My notes for the 2010 say: ” Fresh, rich, ripe, lively, a smokey creaminess, pineapples. Super.” My notes for the 2008 say: “Nettles, lemons, cowslips, custard and lillies nose, smoke.” There was a lot going on. As I said, intriguing. At around three times the price of Brown, I’m unlikely to be buying a bottle soon. If I win the lottery, I’ll be heading to Slurp for a case. More affordable perhaps is the skincare range made by Mathilde Thomas, the daughter of the Smith Haut Lafitte owners, which is based on polyphenols found in grape seeds. Called Caudalie, it has now added products based on a chemical compound found in the vines themselves called resveratrol. I’m not going to repeat claims about the anti-ageing benefits as I think there is a limit to what a skin cream can achieve. But I can tell you this. Caudalie’s gentle cleanser makes my skin baby soft (I don’t wash it off) and its Crushed Cabernet Scrub is the best I’ve ever used. These are products I purchased before I was invited to try a facial at Caudalie’s London pop-up spa. 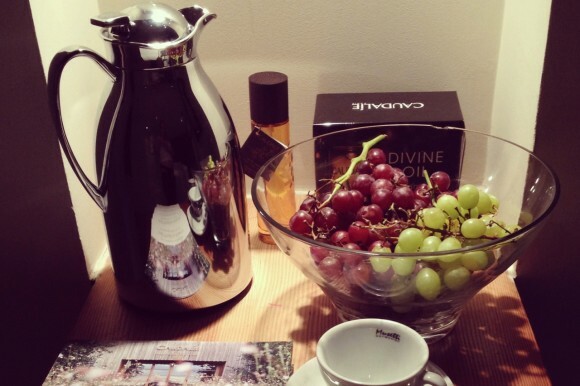 At a Caudalie Spa, you don’t get treated by a beautician or an aesthetician. No, a vinotherapist takes care of you. Sadly without a glass of wine in hand. 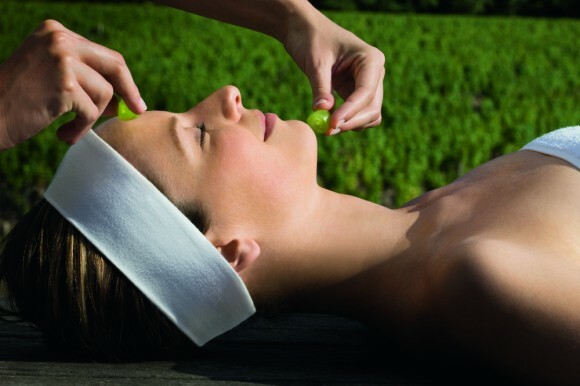 I opted for a Vinexpert Firming Facial to restore my skin’s “freshness and luminosity” and my “stroll through the vineyards” began. What can I say? It was very, very nice. The vinotherapist used a lot of products. They smelt and felt great – especially the Beauty Elixir. Elgar was playing in the back at one point – a change from the usual new age stuff loved by spas. I got cold towards the end, and a heated mattress was turned on. I may possibly have dropped off under the mask which covered my entire face, including eyes. After 60 minutes – which felt like 90 – it was all over, bar a cup of Caudalie tea (still no wine). I was discharged, fresh-faced, back onto the sweaty underground. While it hasn’t turned back the clock so that I look as young as the woman in the picture below, when my husband saw me, he said my skin looked very good. He’s not someone who tends to fib to make me feel better. So the facial had done its job. I was fresh and luminous indeed.